Modern functionality meets straightforward styling. Simple. Bold. True. The sleek and sophisticated design of the Bar Pulls Collection makes a statement with clean lines and smooth textures. 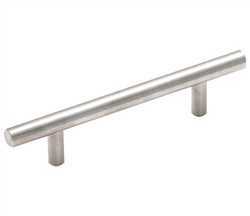 The Amerock BP19011SS Bar Pulls 3-3/4in(96mm) Center-to-Center Pull is finished in Stainless Steel.